The highly sophisticated and wide spread fist aid system make the beach safe for both tourists and bathers. The facilities, the staff, the equipment and all other means guarantee prompt interventions in case of difficulties or sicknesses on the beach as well as at sea. Six first aid stations, equipped with six defibrillators as well as highly skilled staff are available directly on the beach for emergencies. This service is provided every day from May to September. 28 lifeguard stations at the beach with highly skilled staff qualified for Bls (Basic Life Support) and Blsd (Basic Life Support Defibrillation) practices. These are the free sanitary services provided to tourists by Bibione Spiaggia Srl. The baby changing stations to meet the mothers’ needs! Bibione beach specially cares not only for children, but most of all for their mums. Along the sandy beach you can find 10 baby changing stations (via Regolo, Piazzale Zenit, via Firmamento, area Terme, Piazzale Adriatico, via Vivaldi, via Mascagni, via Passeggiata al Mare – Bibione Pineda, via Taigete, via Colonie – NUOVO POSTO AL SOLE), that are comfortable rooms equipped with baby changing stations and water. A free service that enables mothers to change and refresh their children in a quiet place. The beach is equipped with special slides to facilitate the entry and easily reach the different areas. Furthermore the first beach umbrella adjoining the beach pathway is reserved for tourists with disabilities equipped with an additional walkway to facilitate movements. 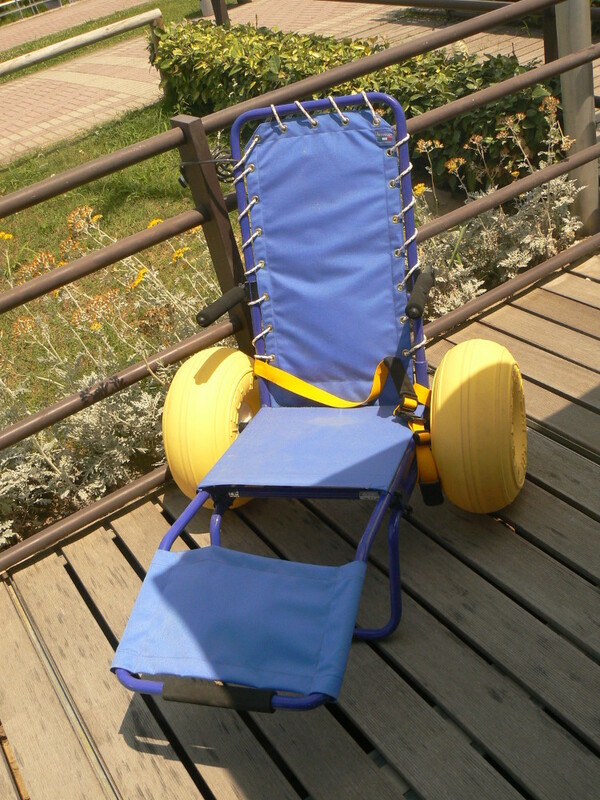 We would also like to highlight that special wheelchairs (beach wheelchairs) are available to reach the sea and bathe safely. Finally all dedicated toilet facilities are equipped with safety bells in case of need. 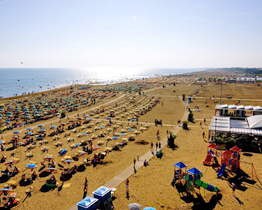 Bibione has been the first beach to provide a “Customer Service”. From 8 a.m. to 8 p.m., non-stop opening time, skilled, competent and helpful staff is available to take care of any kind of tourist request.